What does a maize geneticist do? 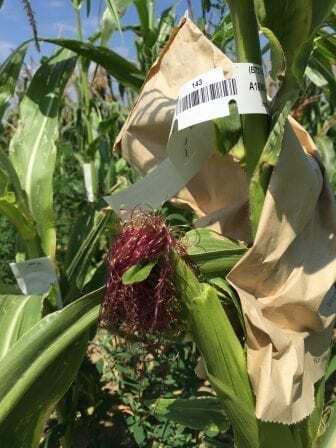 Explore the growing season of maize, and how scientists study the plant’s genetic diversity and connect it to the phenotypes they observe. Maize needs lots of sun and warm weather to grow. Seeds are usually planted in spring, in marked rows to identify each plant by its pedigree and genotype. In the mid-summer, when the plants are ready, scientists begin crossing the varieties of maize. 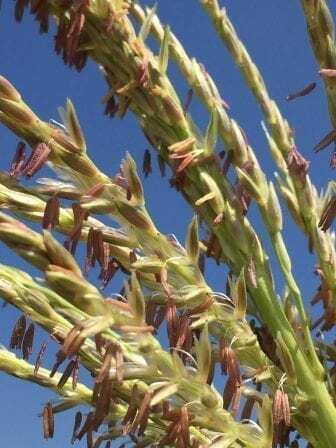 Crossing is done by taking the pollen from the tassel (“male” part of the plant) to pollinate the silks on the ear (“female” part of the plant). Since each kernel is pollinated by one pollen grain, every kernel on the ear has the capacity to be genetically different from every other kernel on the ear. Controlling the crosses is important to understand the genotype/phenotype relationships. To control the crosses, the ear and the tassel are both covered with a bag before the pollen and silks are mature. Maize plants used in research can either be “selfed”–when the nascent kernel is pollinated with its own pollen, or “crossed”–when pollen is taken from one plant to pollinate the ovules of another. While the plants are developing in the field, researchers can observe a broad spectrum of traits, like plant height, leaf angle, flowering time, effects of drought or wind, etc. Frequently, one variety of maize is planted in multiple environments to study how different genotypes react and survive under different exposures to heat, sun, water, and other resources. Scientists also collect samples of various tissues from the plants to sequence the DNA, which allows for correlations of genotype with various phenotypes. The ears of the maize plant are harvested in the fall and measured for ear weight. Scientists often take additional measurements at this time like grain quality, ear length and width, number of kernels, etc. These measurements (all phenotypes) are then analyzed with the sequencing data (the genotypes) to understand the DNA sequences that translate into the traits they observe.